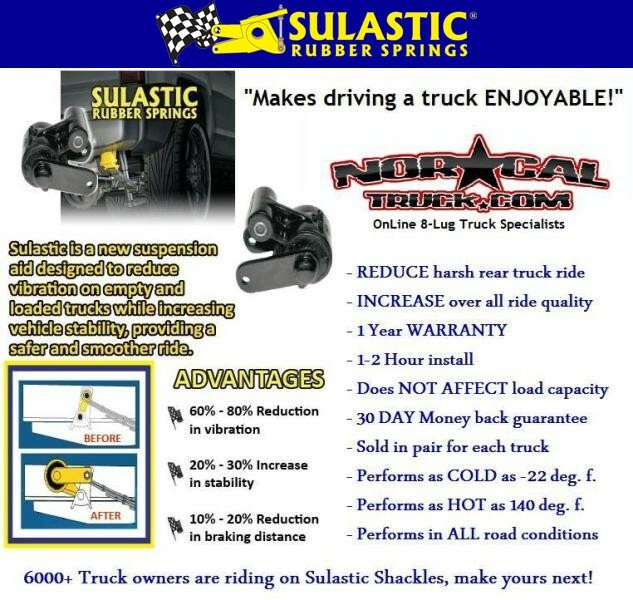 Sulastic shackles are basically rubber isolators that take the top heavy spring rate off these 3/4 & 1 ton trucks when driving down the highway or city streets. In a way, these shackles are making your factory spring into a "progressive" style ride without reducing your spring weight capacity. I purchased my dually in December of 2007 and installed a leveling package along with the Sulastic Shackles and my personal spec'd Bilstein (Zinc) 5100's for daily driving. I also pull a fifth wheel trailer (about 18k lbs) and I have AirLift helper bags to accommodate the heavy fifth wheel pin weight. The truck rides great and and my family and I really do enjoy driving the truck for short or long trips. I am currently running a 4" Cognito Motorsports lift with 35" tall tires along with the same Sulastic Shackles originally installed. Hauling anything from a small trailer or my 20k fifth wheel Toy Hauler, to a 25k lbs+ loaded goose neck trailer, I am still very happy with the performance of the ride quality of this product. I highly recommend these shackles to any 3/4-1 ton truck owners for daily driving or heavy hauling, you will be happy. Take the top heavy spring rate off your truck while driving down the highway or city streets. Shackles make your factory spring into a "progressive" style ride without compromising your spring weight capacity. Got mine on Friday. WIFE Approved!!!! They really help with the "kidney shot" bumps, almost not even there. Best mod on the dually yet until the lift gets done!!! Yes I will agree with the above statement. These really helped with the concrete freeway as well as everyday jarring bumps money well spent. Thanks Nick. NorCal Nick installed the Sulastics for me last week. They eliminate that immediate spring-to-frame harshness induced at every bump. They also eliminate the annoying vibration in the leaf ... the feedback-whip vibration (spring-stutter?) immediately after a bump. The Bilsteins had already tamed it quite a bit, but the Sulastic shackles totally damp it out. Just back from 300+ miles on NorCal freeways, and I'm totally satisfied with the Sulastics, drop-version. I don't have airbags, but Nick's white dually has them plus the Sulastics for everyday comfort. His CC dually rides exactly like my XCab. 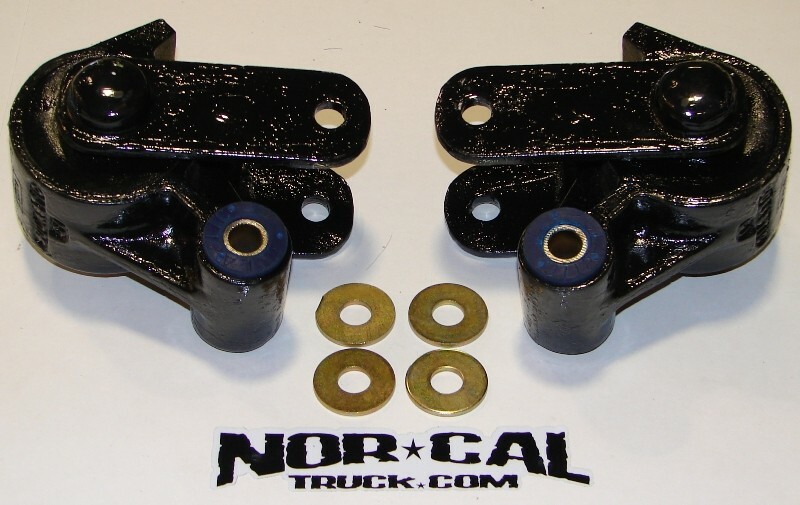 Two weeks ago NorCal Trucks installed the Sulastic Shackles. I wanted to drive it a few hundred miles and before the assessment. To clarify, the truck is still a truck. I can't say it's a significant improvement but enough to reduce that gut wrenching harshness from the rear and the rapid bunny humps. Much softer, enough to take the edge off which is what I was looking for especially when the gas tank was empty. Wish I would of done this long time ago and well worth the investment. I just got the Sulastic Shackles put on yesterday. And let me tell you what huge difference to the now what stiff bounce in the rear. Soon as I drove away from Nick's shop and went over the speed bumps. WOW. I actually feel like I am driving a car. No more going over bumps, dips and have the rear end feel like it just hopped side ways on you. I would definitely recommend these products if you’re looking for a better quality ride and smoothness to your truck. Major difference. I have had the Sulastic springs installed for a while now and I was very pleased with the ride improvement. One way I could describe it is that the rear suspension is similar to the front now when going over bumps. It is much smoother as opposed to the harsh jar that was there before. They are made much heavier than the stock shackles also. I would recommend them if you are looking for a smoother more "car-like" ride from your pickup. Thanks to Nick for a great product.